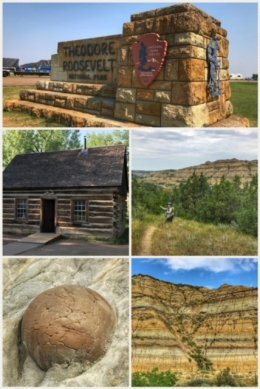 Theodore Roosevelt National Park lies in an area where the former president lived and raised cattle as a younger man (a time that he attributes to helping prepare him for the presidency and also his advocacy for conservation of our wild lands). It is located in western North Dakota, near the town of Medora, a somewhat desolate area where the great prairie meets the badlands and the Little Missouri River; it is one of the least known and visited of the national parks, which was fine for us after recently visiting the overcrowded Yellowstone. It is also the only national park named after an individual. 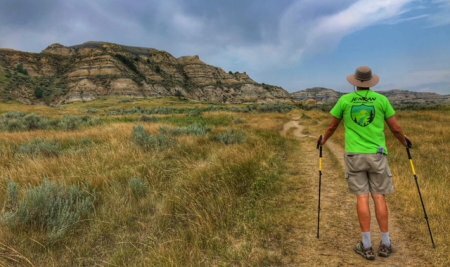 President Roosevelt took his love of nature and conservation from his time in North Dakota and established the U.S. Forest Service in 1905 and signed the 1906 Antiquities Act (under which he established 18 national monuments). 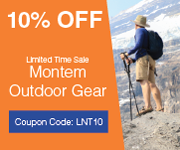 He also worked with Congress to create five national parks, 150 national forests, and dozens of federal reserves — protecting more than 230 million acres of land. The park officially consists of three units: The South Unit (which runs along I-94, the Elkhorn Ranch (one of two of Roosevelt’s ranches), and the North Unit (just off U.S. 85 south of Watford City). 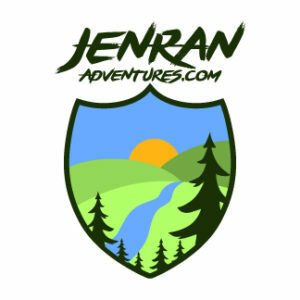 That said, if you are visiting, there are really five areas: The South Unit, which includes a wonderful scenic byway; the Painted Canyon area (technically part of the South Unit); Petrified Forest area (also technically part of the South Unit); Elkhorn Ranch; and the North Unit. As our tradition, we started at the visitor center in the South Unit. It was especially cool because this was the first national park that we biked into! The visitor center has a great movie (we always try to watch the movies at all the places we visit). Behind the visitor center, you can also check out the relocated Maltese Cross Cabin (shown in the first collage), a temporary home for Roosevelt before he purchased the Elkhorn Ranch. The cabin has a few reproductions and informative displays. Most people who visit just go to the South Unit, but we strongly recommend taking another day and visiting the North Unit, which just has a different feel to it; we loved the our day hiking and driving in the North Unit. 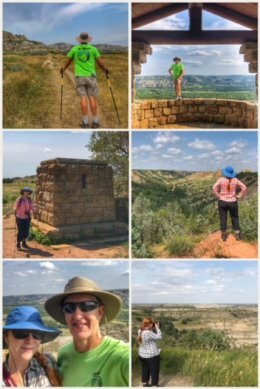 We hiked about four miles, including parts of the Buckhorn Trail and Caprock Coulee Trail. 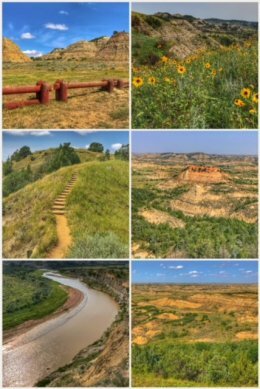 We also drove the Scenic Drive to the Cannonball Concretions Pullout (see bottom left of first collage) and Riverbend Overlook, as well as a few other non-marked pullouts. 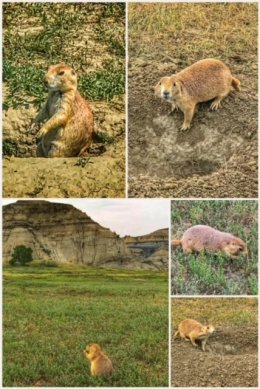 The North Unit offered so many highlights for us, including walking through and above the badlands and meeting with Ranger Jeff Van Hooser who shared some great advice with us… but for the entertainment value, the prairie dogs won our hearts. 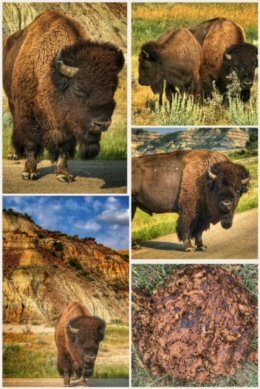 More spectacularly, toward the end of the day, we were fortunate to encounter a small herd of bison on and along the roadway. The majestic beasts were all but eliminated from this country through overhunting; in fact, when the park was founded in 1947, there were no bison. Starting with 24 females and 5 males introduced into the South Unit, the park now has to conduct roundups every 2-3 years to cull the herds, sending thousands of bisons over the years to tribes and reservations, other national parks, state parks, zoos, and other conservation herds. The park does an amazing job of tracking and analyzing the bison (including DNA testing), yet they remain wild and free within the park boundaries — and should NOT be approached, as they can be quite dangerous. The prairie dogs, on the other hand, are just so entertaining and endearing. The good news is that there are many prairie dog towns in both the North and South Units; some have to be hiked to while others are right along the side of the road. These animals (which are related to ground squirrels, chipmunks, marmots, and woodchucks) can be found munching on grasses, running along the prairie, or hovering over their burrows — ready to dive down or send out the warning chirp to all the other dogs. (Sometimes they do a little Prairie Dog wave; so darn cute!) The species in the park are the black-tailed prairie dog, which weigh about 1-3 pounds and are about 14-17 inches in length. The South Unit has a 36-mile scenic drive with many pullouts with interpretive signage — as well as some very short, but fun trails. We hiked several trails that day, including the Old East Entrance Trail (which follows the path of the original park road to the now-abandoned park entrance station, as well as through a prairie dog town), the Coal Vein Trail (which is over an area that had an underground coal vein fire for more than two decades), the Ridgeline Trail (a badlands nature trail), Buck Hill Trail (a paved trail to the second highest point in the park), Boicourt Trail (offering one of the best views of the badlands along a high bluff), and Wind Canyon Trail (which has nice views of the Little Missouri River and the wilderness beyond). We ended the visit with a short hike along the Painted Canyon Trail in the Painted Canyon area of the South Unit (and a separate entrance off of I-94). We did not visit the Elkhorn Ranch, as not much remains of the original ranch. We also did not go to the Petrified Forest area of the South Unit, which requires either a massively long hike or a long drive on a gravel forest road; we have already visited Petrified Forest National Park (in Arizona), so did not feel the need to go out of our way to see that area of the park. Next up we visit a few more areas of North Dakota, before heading “home” to South Dakota.